With one of the star ingredient "Acerola"which has whitening properties to help prevent the formation of pigmentation and freckles. There's also "Acai Berry" which contains powerful antioxidants that's more effective than red wine to help delay premature signs of aging. 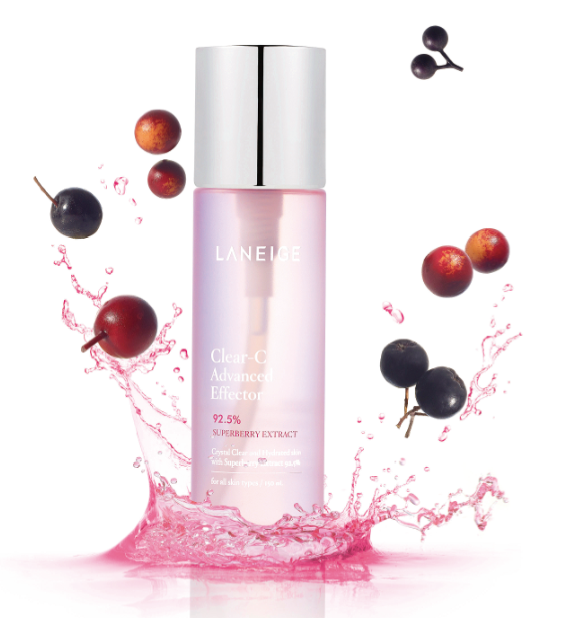 With a four-fold anti oxidative effect compared to regular Vitamin C, these two ingredients work hand in hand in Clear C Advanced Effector to help achieve clear, glowing and translucent skin. Recognising that vitamin C and antioxidants are, in themselves, unstable compounds, Clear C Advanced Effector also has Silicium Capture Technology to stabilize the active ingredients.The water found in Hunza village, Pakistan, known to be rich in colloidal silica particles, serves as inspiration for the technology. These particles contain charged surfaces that absorb minerals and hydrogen negative ions to better preserve the anti oxidative function of the fruit extracts. Priced at $56 for 150ml, inclusive of 60 cotton pads, LANEIGE Clear C Advanced Effector will be available from 8 January, 2015 at all LANEIGE boutiques and counters.